710 Study San Rafael Neighborhood Posts: More Lanes on the 710 Means More Trucks: More Trucks Means More Pollution, Get it Caltrans? More Lanes on the 710 Means More Trucks: More Trucks Means More Pollution, Get it Caltrans? 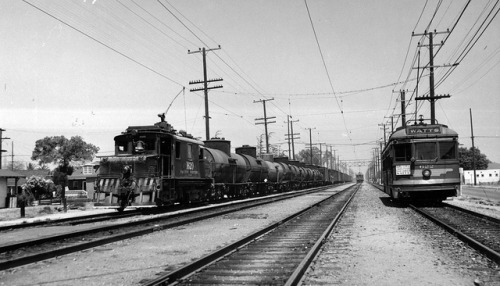 L.A.’s Pacific Electric trains delivered freight in their day. The Arts District of downtown Los Angeles is now a vibrant residential community. But the signs of its warehouse past are everywhere. Abandoned railroad spurs, peeking up from the asphalt and running down old brick streets, speak volumes about bad public policies and metrics that, even as LA struggles to rebuild its once-great transit system, persist in too much of its bureaucracy. That’s exemplified in two 710 freeway studies released by Caltrans and Metro. The study for the northern section came out in March and looked at the “gap closure” from Alhambra to Pasadena, where the 710 would join the 210. The study for the southern section was released in June 2012 and looks at widening and double-decking the segment that runs 20 miles from the ports to the Pomona Freeway south of downtown. This chunk is mostly about freight and would cost around $8 billion. Together, the environmental studies cost millions and number 2300 pages, with over 26,000 pages of supporting documents. The Interstate Highway System changed the economics of trucks vs. trains for local delivery. 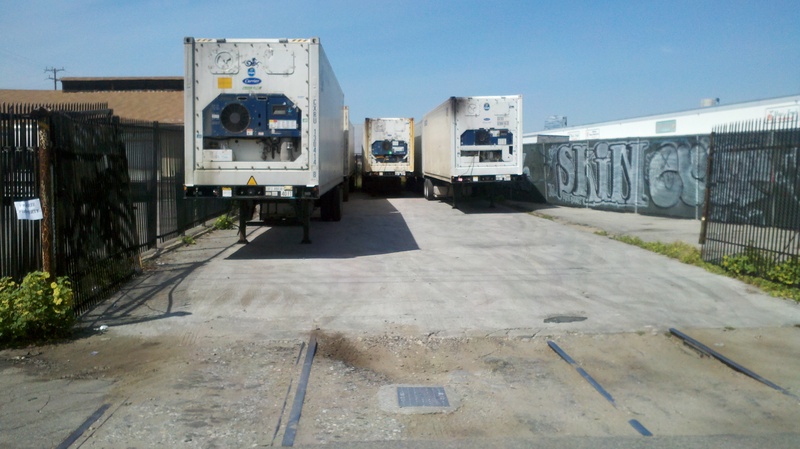 Truck trailers now park on abandoned rail spurs in downtown L.A. Most people know that Los Angeles had a comprehensive mass transit system, the Pacific Electric. But the Pacific Electric, along with other railroads of Southern California, also delivered freight. All the building materials and manufactured goods that made the economy of Los Angeles was once delivered on local rail spurs directly to warehouses, many of them in downtown LA. Railroads have to maintain their own infrastructure—meaning thousands of miles of tracks, switches, spurs, bridges, signals, yards, etc. So they focus on their long-distance mainlines where they get the most bang for the buck. Trucking companies, on the other hand, get an all-but free ride on roads built by state and local governments. They also cause a disproportionate amount of damage. As a result, when cargo comes off a ship in Los Angeles, if it’s staying in the region or going no farther than Nevada or Arizona, trucks cost less. If it’s going to Memphis, Chicago or anyplace east of the Rockies, or around 550 miles or more, it’s more cost-effective to combine the shipments onto a single freight train—often more than a mile in length—rather than paying some 300 truck drivers to do the same job. Some long distance trains are put together right on the docks. Others are assembled in what’s called “near dock” yards—trucks scoot containers from ships to rail yards a few miles away, where they are transferred onto those giant freight trains. But today’s largest ships carry 19,000 containers. There isn’t enough area near the docks to handle it all. So over 800 trucks a day use the 710 and other connecting roads to get to giant rail yards in Commerce. The situation was worse before the Alameda Corridor, a dedicated, 20-mile freight train “expressway,” with a three-track mainline, roughly paralleling the 710. Completed in 2002, it greatly improved the connection between the ports to the rest of the national rail system. The Alameda Corridor handles about 45 trains a day, helping them get back and forth to the docks quickly. Each train carries the cargo equivalent of 250 to 300 trucks, explained John Doherty, chief officer of the authority that operates the Alameda Corridor. It would take over 11,000 trucks, every day, to do the job of these trains. But the Corridor is operating at 36 percent capacity, he explained. It could handle 105 more trains every day, or the equivalent of another 26,000 trucks. Policy makers have a choice: add more lanes to the 710 or figure out how to get more stuff onto trains. And that’s where Caltrans fails. The most glaring omission in both studies, but with the 710 South especially, is a failure to consider induced demand. A source at one of the transportation agencies, who spoke on condition of anonymity, admitted that they didn’t look at it—a least, “not explicitly.” Wired Magazine did an excellent primer on the concept. Think of the latest 405 widening — despite what LA’s planners think, widening freeways doesn’t reduce congestion. Furthermore, trucks burn as much as ten times more energy per ton of cargo than trains. So if the mission is to improve air quality, reduce greenhouse gases, and facilitate more goods movement from the ports, why not push more stuff onto the Alameda Corridor, rather than inducing more truck traffic by double decking the 710? There are projects in the works. Take the Southern California International Gateway (SCIG), a planned near-dock yard near the Dominguez channel, right on the Corridor. The $500 million project, which would be funded by the Burlington Northern Santa Fe Railway (BNSF), was approved by the Los Angeles City Council two years ago, but construction of the yard, which is four miles from the docks, has stopped due to a lawsuit. The project includes $100 million for low emission and no-emission trucks and trains. However, “We’re opposed to SCIG in all shapes and fashions,” said Mark Lopez, a representative with East Yard Communities for Environmental Justice and a party to the lawsuit. “We believe they can handle the freight on the dock.” Lopez and others argue the yard will exacerbate traffic jams and pollution from trucks delivering containers to the Union Pacific Railroad’s near-dock yard, the Intermodal Container Transfer Facility, which is next to the planned SCIG location. Siemens has a prototype electric truck that they are currently testing, but that’s it. It’s unclear who would pay for these new trucks or if they would be reliable, economical and safe. The EIR estimates electric trucks would reduce overall diesel fuel consumption by only 6 to 8 percent. Rather than including this as an option in the EIR, one has to wonder why Caltrans wouldn’t first try it on a shorter run, for example, by installing the catenary on the existing four-mile corridor from the ports to Union Pacific’s Intermodal Container Transfer Facility. And if zero emissions is the goal, why did Caltrans toss out electrification of the rail lines, which requires no new technology? The National Resources Defense Council did a great piece about how the Russians electrified the Transiberian railroad, which is over 5,000 miles long, back in 1929. Rail electrification is the norm in Europe. In the US, of course, one only has to look at the Northeast Corridor from Boston to Washington, DC. 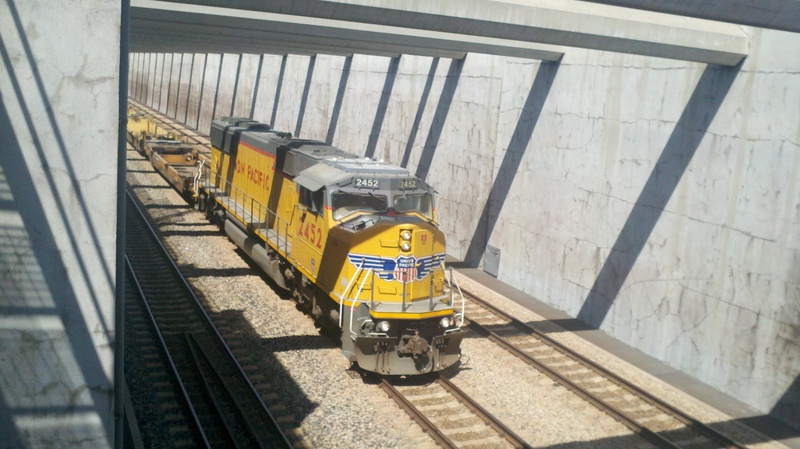 Or the Black Mesa and Lake Powell Railroad, a short freight rail line in Northern Arizona. And the Pacific Electric used to run electrified freight trains right here in Los Angeles. Either way, the Alameda Corridor could be used for shuttle trains that would move cargo containers between the inland long-distance train assembly areas and the ports, as is now done by truck. In fact, the Caltrans study concludes that moving goods by rail would “markedly reduce heavy-duty truck traffic on the I-710.” But “…the Enhanced Good Movement by Rail component was removed…because these projects and other efforts to maximize the amount of goods movement by rail would not be completed as part of the I-710 Corridor Project.” The source at Caltrans confirmed what the EIR seems to say: rail enhancements were nixed simply because they’re not physically on the 710. Doherty said shuttle trains are occasionally discussed but they would require subsidies to be economical. There are other question marks. The Russian government has approved a $66 billion project to build a rail tunnel under the Bering Strait. The Chinese are talking along the same lines. If they succeed, West Coast ports may become redundant. Additionally, electrified trains, depending how the power is produced, can be carbon-free. As one transportation expert with rail and nautical expertise put it, even without the tunnel, there’s going to be pressure to increase rail and seaward capacity at northern ports closer to Asia, as a a way of reducing greenhouse gas emissions from ships. Either way, it seems strange that in the US, a country that stresses free markets, a state agency is so eager to provide free infrastructure for trucks. That’s why, as the Wired magazine piece points out, we have the equivalent of Soviet-style bread lines on our roads. It’s as if the Teamsters are telling Caltrans what to do. It took the Soviet Union 70 years to realize this kind of economics doesn’t make sense. When will we?